Have you only experienced eastern Mediterranean food through the narrow lens of packaged items found at the supermarket? If so, the time has come to step outside the package and experience the bleeding edge of a food revolution. Mediterranean has expanded to include regional flavors and variations on some now-familiar fare from countries on the far eastern side of that vast sea. As a country, the United States learned decades ago to embrace hummus. The popular dish celebrates the food of a region that spans from Turkey and Greece in the west to Syria and Iran in the east. We have come to love feta, a cheese long associated with Greece but which has expressions around the region. While we have welcomed the foods of the Mediterranean, we are slowly coming to understand the foods specific to the eastern Mediterranean region. Known as the Levant, the eastern Mediterranean includes a fractured map of nations including Israel, Palestine, Lebanon and Syria. We, as Americans, tend to think of the region mostly for what we hear about the area’s politics. But scrap the boundaries formed by western governments of old and look deeper. Look at the food traditions, the shared heritage, the varied styles of feta or how the region’s chefs season their hummus. 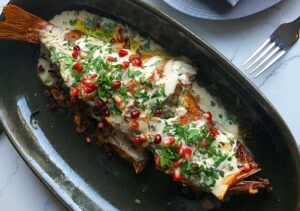 Into this wide space, chefs are starting to bridge the gap between Mediterranean and Middle Eastern. Israeli restaurants, long open in New York, are now popping up across the country. Kebabaries, fast-casual restaurants that focuses on the grilled meats of the region, feature the country’s new favorite barbecue. And new flavors are emerging—flavors of the home cooks who hail from Greece, Turkey, Lebanon, Jordan, Palestine and Syria. The dishes at Tawla are prepared just as they were by her mother in the kitchen of Hashem’s childhood home. In the kitchen, around the family table, borders are irrelevant. Whether gluten free or not (Tawla serves both), breaking bread, a phrase that dates to biblical times, is an important component in culture, an opportunity to share ideas, discuss disagreements, and find, once again, commonality across differences. And bread, as an important part of the regional cuisine, is also a part of the cuisine at Tawla. The menu is not entirely gluten free and includes traditional breads, both gluten free and gluten-full, just as are available in the region. Puffy pita makes regular appearances. You’ll also find borek, or flaky pastry stuffed with cheese, here. Hashem also worked to develop a gluten-free chickpea cracker in a style native to the region. “We try to make sure the food is true to place and ingredient,” said Hashem. Before opening Tawla in 2016, Hashem and Magidow went through a sort of cooking gymnastics, searching for foods that “are similar throughout the region but shake it up a little.” Two iconic dishes of the region made it onto the menu. 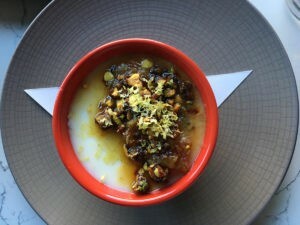 Mansal, a lamb dish cooked in yogurt that, according to Hashem, “is fermented and preserved by Bedouin to withstand harsh environments and difficult conditions,” is served over rice embellished with almonds and pine nuts. “It is very Jordanian,” said Hashem. 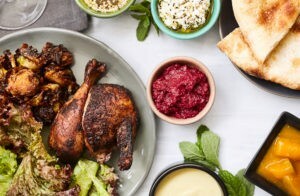 Mousakhan, the national dish of Palestine, is chicken that spends some time with allspice before it is cooked in a sauce of sumac and pine nuts “to make a crimson crust,” Hashem says. 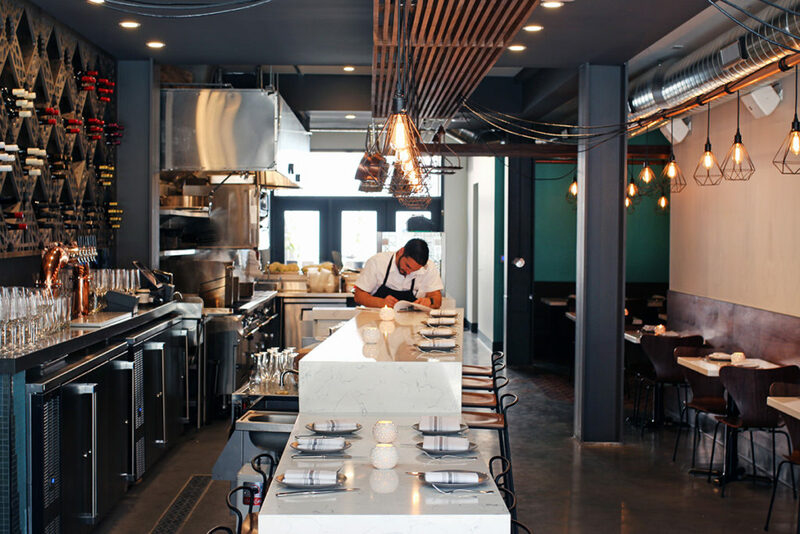 Both chef and owner like to keep things interesting while staying true to the region’s flavors. They look for dishes that are similar throughout the region but express themselves differently from port to port. Moussaka, a dish of eggplant and ground beef with a béchamel sauce in Greece, is a variation that might appear on the menu in cooler months, when a heavier sauce feels right. The Levantine version, with just tomatoes and eggplant, “is good for summer when tomatoes are peaking,” says Hashem. Every dish has a proper name, but variations are as abundant as the number of languages spoken in the area. As most of the region faces Mediterranean waters, fish is an important component on Tawla’s menu. Molokhia, a dish named for the green mallow leaves (also known as jute leaves) that add subtle spiciness, traditionally contains chicken or red meat. Magidow’s version with shrimp expresses an Egyptian character. “Around Alexandria, this is the local version of molokhia,” explains Hashem. Hashem’s family recipe for muhammara, the traditional puree of toasted walnuts, red bell pepper and pomegranate molasses, is entirely gluten free. Experiencing this dish for the first time at Tawla, the freshness of flavor and complete lack of bread crumbs shocked me. Not only does the dish need no bread, but its addition does not honor the home cooking style of Hashem’s restaurant: “We don’t add crumbs to the muhammara because you don’t need it; bread does not need to be a bulking agent in this dish.” Taramosalata, a Greek-style dip made with fish roe, similarly does not call for bread. As always, variations abound. At Tawla, the produce-forward, seaward-facing menu is a fresh approach to the flavors of the Middle East. The restaurant does not serve hummus. However, it does offer a chickpea saffron fritter with Meyer lemon and a cured duck egg. There is no sign of kebabs, but chicharrónes with baharat make a fine substitute. A fish and a vegetarian entrée are always available. Though Hashem wishes to shift the perception of the region as meat-centric, there is lamb as well as the less-expected buffalo steak. The menu is wide and welcoming, and gluten need not play a part of a large and satisfying meal. Dining at Tawla is delightful, an opportunity to deepen your knowledge of the foods native to this expansive region. Culinary history runs deep here. The chance to experience a single dish in its many regional iterations is a unique thrill. Eating at Tawla presents a chance to experience fresh flavors of the eastern Mediterranean just emerging onto America’s consciousness. Can mainstream mujadara be more than a decade away?